This Valentine’s Day let InterContinental Hong Kong provide the electrifying venue to ignite romance, with special Valentine’s menus, highlighted by superb cuisine, attentive yet discreet service and dramatic harbour views. In February, treat that special someone to a relaxing and pampering experience at I-Spa with our “Breath of Love Valentine’s Experience”, a customised 2- hour treatment, inclusive of 30 minutes use of the private spa suite and a glass of Champagne served at the Pool Terrace. Awarded 1-Michelin star by the 2019 Michelin Guide, Rech by Alain Ducasseshowcases the freshest fish and oysters direct from France. If you love fresh seafood, you’ll adore Rech. With its spectacular harbourviews, Rech is the ideal venue for a romantic Valentine’s Dinner which is sure to impress. Executive Chef Stéphane Gortina has created a 6-course Valentine’s Day menu priced at HK$2,988 for 2 persons, with wine-pairing for an additional HK$688 per person. The menu begins with Seafood platter to share featuring Langoustine, pink shrimp, Fine de Claire n°2 and Creuse spéciale n°2 oysters, hard clams and whelks. Next is Blue Lobster Consommé, Kristal Caviar and Samphire. This is followed by Sea Scallops in their shell, with Salsify/Chestnut/Black Truffle, and then Veal Fillet with Baby Carrots, Parsley and Lemon. Next indulge in ‘Coeur de Saint-Félix-Lauragais’ Goat Cheese. Save room for the special dessert – Chocolate/Passion Fruit, with passion fruit cream and chocolate mousse made with chocolate from Mr. Ducasse’s Manufacture in Paris. NOBU InterContinental will celebrate Valentine’s Day with a special 8-course Omakase Valentine’s Day Dinner at HK$3,288 for 2 persons. As per Nobu Matsuhisa, “I always put something special in my food – my heart or “kokoro” as we call it in Japanese. The menu starts with dishes by Executive Sushi Chef Kazunari Araki including Botan Ebi & Taragai Sashimi with Fig Dressing. This is followed by Awabi, Toro, Uni & Kinmedai Sashimi with Beetroot and Truffle Cauliflower Purée. After a Deluxe Sushi Assortment, enjoy Spanish Red Prawn Nitenmori Dumpling with Chili Amazu and Tempura Garlic Cilantro Aioli. Next is Steamed Sea Bass Fillet with Black Bean Sauce, followed by A5 Miyazaki Wagyu with Anticucho Miso and then Akadashi (Red Miso Soup). Save room for the dessert by Nobu Pastry Chef Joanna Yuen – Rose Lychee Mousse with Pear Jelly and Lychee Sorbet. For a “hearty” meal, THE STEAK HOUSE winebar + grill presents a 4-course dinner menu by Chef Chiu Ming Chan at HK$1,538 per person. The special menu begins with the “Lovers’ Salad Bar” which includes Royal Smoked Salmon, Duck Foie Gras Terrine and Ham and French Cheese Platters. Next “for Her” is Creamy Truffle Mushroom Soup and “for Him” is Alaskan King Crab Bisque. From the Charcoal Grill for the main course there is a choice of USDA Petit Filet Mignon (6oz), USDA Striploin (10oz), US Rib Eye (12oz) or Chilean Sea Bass (10oz) – all served with a Rose shaped Potato, Black Garlic Cauliflower, Broccolini and Quail Eggs in a Mini Bell Pepper. 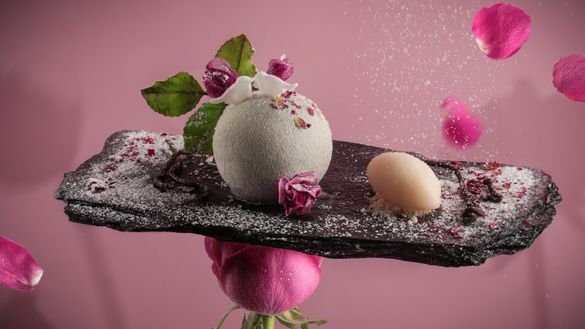 For dessert, InterContinental Hong Kong’s Executive Pastry Chef Christian Gonthier has prepared a special “Coeur Croquant” made of a Coconut Daquoise Palette with lychee and raspberry cream, and red berries. With its dramatic panoramic harbourview, the Lobby Lounge offers a romantic option for Valentine’s Day Dinner. Enjoy a 3-course menu at HK$1,999 for 2 persons inclusive of two glasses of Perrier-Jouët Grand Brut NV. The menu by Executive Chef Maxime Luvara features a starter of Marinated Hamachi and Saffron Scallop, Plum Salmon Roe and Kaluga Caviar with Honey Strawberry Dressing. For the main course, US Beef Tenderloin and Pork Belly Roulade, with Muscat Wine Jus, Beef Cheek Ravioli and Butter Poached Boston Lobster with Bone Marrow Mashed Potatoes and Organic Baby Vegetables. For dessert, Executive Pastry Chef Christian Gonthier presents his ”Coeur Croquant” – made of a Coconut Daquoise Palette with lychee and raspberry cream, and red berries. Begin or end your romantic evening with cocktails in the Lobby Lounge, with the stunning backdrop of Victoria Harbour and Hong Kong Island. Sip on Tequila Cabeza Cocktails by our resident mixologist Sabrina Cantini-Budden, who has created the first in our new series of cocktail promotions showcasing artisanal and craft spirits from around the world. From 9:00pm onwards on Valentine’s Night in the Lobby Lounge, enjoy the sulty vocal styling of Jennifer Palor, Asia’s leading jazz diva, who blends refreshing, unconventional jazz sensibilities with a modern urban feel, to create her own distinctive sound. From February 14 -19, our 2-Michelin star Cantonese Restaurant Yan Toh Heenpresents an 8-course set menu at HK$1,688 per person (for a minimum of two persons) to mark Valentine’s Day and the Spring Lantern Festival, which is celebrated on the fifteenth day of the first month in the Chinese Lunar calendar to mark the final day of the traditional Chinese New Year celebrations. Dating back over 2,000 years ago, during the Spring Lantern Festival, which dates back to 20, young people carrying lanterns in the streets were chaperoned in hope of finding love. The brightest lanterns were symbolic of good luck and hope. Over time, the Festival no longer has such implications in most of Mainland China, but it is still commercialised as the Chinese equivalent of Valentine’s Day in Hong Kong, as well as Malaysia and Taiwan. Executive Chef Lau Yiu Fai’s Cantonese Valentine’s menu includes Golden and Fresh Scallop with Fruit Vinegar, Double Boiled Imperial Bird’s Nest Soup with Fish Maw and Bamboo Pith and Golden Stuffed Crab Shell with Crabmeat. This is followed by Steamed Garoupa Fillet Rolls with Yunnan Ham, Ginger and Spring Onion, followed by Simmered Carabinero Shrimp and Egg with Chili Sauce. Next is Wok-fried Wagyu with Green and White Asparagus and Fried Rice Wrapped and Steamed in a Lotus Leaf. The à la carte menu is also available. Looking for an alternative to an intimate Valentine’s Dinner? Why not treat your loved ones and friends to Harbourside’s acclaimed Dinner Buffet? On Thursday, February 14th, indulge in Harbourside‘s elaborate Dinner Buffet with abundant fresh seafood and sushi, foie gras, tempura and a tempting array of Western and Asian dishes, along with a roast carving station with prime cuts of top quality Kagoshima Japanese beef, plus action stations and decadent desserts. You can also add-on a platter of fresh Fine de Claire No.3 oysters – served at your table. Children’s price is applicable for children ages 3-11 years old. Please add 10% service to all prices. This offer is only available on our e-shop through February 10 inclusive, subject to availability and advance purchase. Advance reservations for all of our restaurants are highly recommended. 2 hour treatment: HK$2,250 per person, inclusive of a glass of Champagne served at the Pool Terrace, plus 30 minutes use of the private spa suite. Spoil yourself and someone you love with the gift of a personalised “Breath of Love Valentine’s Experience”. The package begins with a private I-Spa Suite heat experience (30 minutes) including steam shower, sauna and hydrobath. This is followed by a detailed consultation, allowing the therapist to discuss your needs and then personalise the treatment to achieve the optimum results. From an organic body scrub, body massage, foot massage or I-Spa Rejuvenating Facial, our therapist will tailor the two-hour treatment to make you feel totally pampered and revitalised. A glass of Champagne served at the Pool Terrace completes the journey. Available from February 1-28, 2019 (10:00am- 10:00pm) Monday to Friday. This offer cannot be used in conjunction with other I-Spa Full Day Packages or other credit card discount promotions. Advance reservations are required and are subject to availability.The package is not available on Public Holidays. For I-Spa images, please click here. Please click here to download high-res images of special Valentine’s dishes and restaurant interiors.